Netflix, Inc. (NASDAQ:NFLX) is slated to report Q2 earnings on Monday, July 17 after market close. The consensus on Wall Street is for the video streaming company to report revenue of $2.76 billion, good for 31.4% year-over-year growth and EPS of 16 cents, compared to 9 cents posted during last year’s comparable quarter. There’s an earnings whisper that NFLX might post earnings of 18 cents, thus extending its earnings beat to seven straight quarters. Netflix has had little problem exceeding estimates by a wide margin in the past, though analysts have wised up to it and the beat has been narrowing. NFLX stock, though, isn’t judged so much on earnings, but rather on another more spurious metric — subscriber growth. Netflix has performed well during times of rapid subscriber growth, and poorly whenever subscriber growth shows signs of slowing down. Netflix stock took a 5% spill after the Q1 earnings call — despite beating on both the top and bottom lines — when management revealed the company had managed to add just 1.42 million domestic subscribers, which was 80,000 short of the consensus estimate. New international subscribers clocked in at 3.53 million, 170K shy of the company’s guidance. 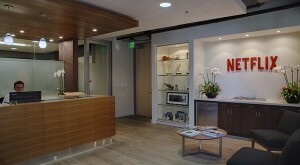 Some analysts opined that the sub-par subscriber growth could be chalked up to Netflix churning out less-than-stellar content offerings, as well as increasing competition from the likes of Amazon.com, Inc. (NASDAQ:AMZN) and Hulu. Historically, Q2 is a seasonally weak quarter for Netflix. It probably doesn’t help that a recent story from Fortune claimed that a Reuters/Ipsos survey has found that password sharing is increasingly becoming a menace for media companies such as Netflix. According to the survey, more than 20% of young adults who stream video have borrowed passwords from friends living outside their households, thereby deriving companies like Netflix of much-needed subscription revenue. Raymond James analyst Justin Patterson reckons that if Netflix revenue growth took a hit from password sharing and slowed from current percentages in the 30s to the teens, the company would be forced to reconsider its lax attitude toward the matter. There’s little doubt that allowing people to share passwords is tantamount to video streaming companies leaving money on the table. Actually, the Ipsos survey might have even under-reported the true extent of password sharing. A survey conducted in 2016 by Survata for Quartz found that 50% of people aged 18-24 mooch off someone else’s Netflix account, and that figure jumped to 69% for teenagers. Overall, approximately one-third of NFLX consumers don’t pay for their own service. Netflix has already crossed the 100-million-subscriber mark. Assuming international trends are similar to those in the U.S. (actually, they are likely to be even worse due to lower income levels), that’s at least 50 million subscribers who piggyback on other people’s Netflix subscriptions. That’s a heck of a lot of potential subscriptions. A U.S. federal court actually criminalized password sharing last year, and you can now be charged under the Computer Fraud and Abuse Act. Netflix, therefore, effectively uses a try-before-you-buy sales model. Hastings’ sentiments seem to be supported by another study, which found that almost half of people sharing passwords would be willing to pay for their own subscriptions if they were no longer allowed to share accounts. Netflix is currently more interested in getting people hooked on its service, but might decide to pull the trigger later. In the meantime, sharing your NFLX password is unlikely to land you behind bars. Just in case if you were wondering if that’s a roundabout way of telling you to brace yourself for another disapointing quarter from NFLX stock, take heart. One UBS analyst explained that content tracking shows Netflix enjoyed ”very strong” momentum during the second quarter. Further, Netflix has won 91 Emmy nominations, second only to HBO’s 110. So, the content problem that plagued Q1 has seemingly been licked. And, let’s not forget that NFLX issued upbeat Q2 guidance of 600,000 domestic subscriber growth vs. Wall Street’s forecast of 420,500, and 2.6 million international subscriber adds vs. Wall Street ‘s 2.1 million. So, it looks like it’s all systems are still a go for NFLX stock. Article printed from InvestorPlace Media, https://investorplace.com/2017/07/password-sharing-not-a-problem-netflix-inc-nflx-stock/.